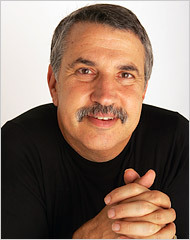 Thomas L. Friedman at the NYTimes.com offers some suggestions for McCain and Obama. Excerpts below. Link: Op-Ed Columnist – No Laughing Matter – Op-Ed – NYTimes.com. We have been living on borrowed time and borrowed dimes. President Bush has nothing to offer anymore. So that leaves us with Barack Obama and John McCain. Neither has wowed me with his reaction to the market turmoil. In fairness, though, neither man has any levers of power to pull. But what could they say that would give you confidence that they could lead us out of this rut? My test is simple: Which guy can tell people what they don’t want to hear — especially his own base. Think how much better off McCain would be today had he nominated Michael Bloomberg as his vice president rather than Sarah Palin. McCain could have said, “I’m not an expert on markets, but I’ve got one of the best on my team.” Instead of a V.P. to re-energize America, McCain went for a V.P. to re-energize the Republican base.